The purpose of this machine is to cut away the top layer of poor quality bog from the section which is to be cut by the excavator boom. This layer, to be disposed of, varies in depth from 1′ 0″ (305 mm.) to 2′ 6″ (762 mm.). The machine has a lightly constructed main frame mounted on caterpillar type tracks and the spiral cutting/conveyor unit is carried in an off-set position at the rear. The spiral cutter/conveyor unit is pivoted to the main frame and suspended on an overhung mast on which it is raised or lowered as required. A separate trimming control, in the form of a hydraulic ram, is fitted at the cutting end. The Type I machine is powered by diesel engine and transmission of standard manufacture incorporating a differential brake/gear steering arrangement as used on levelling machine. There are 8 forward speeds and 4 reverse speeds available through gearbox and change sprockets. The Type II machine is powered by a diesel engine driving through over-centre type clutch, ‘V’ rope drive special worm and spur gear reduction box, and chain drives. The machine is steered by coil clutches on the track final drives. There are 6 forward speeds available using change sprockets. A screw leveller was used to maintain the surface condition of milled peat production bogs. Read More. 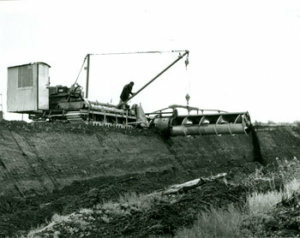 Ditching attachments were used to cut ditches in the bog between milled peat bogs. Read More.